Nintendo UK recently held a Twitter poll to determine the best track in Mario Kart 8 Deluxe. It was ultimately Rainbow Road which was selected first, followed by Hyrule Circuit, Mount Wario, and Bowser’s Castle. “My favorite part is how the two routes form an intertwined spiral, before heading into the final corner. The design allows for lots of different tactical gameplay depending on your items and the situation around you, such as changing your route, or taking a shortcut between the two paths of the spiral. “We have been making Rainbow Road courses as a way of marking the end of each Mario Kart game. 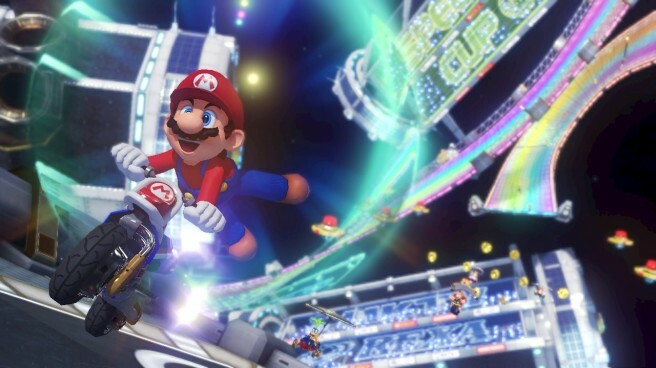 Since we’d decided that Mario Kart 8 would also include a remake of a past Rainbow Road, we worked to create new Rainbow Road visuals and audio making use of near-future technology, such as anti-gravity, in order to contrast with that.